Bear Valley is southwest of the Lake Tahoe basin in the central Sierra and caters to families and locals. The last time we skied Bear Valley was in 2002 when our kids were young and still learning to ski. I also had a couple of visits in the mid-90’s. Unfortunately I don’t have any pictures from any of those visits. On paper Bear Valley looks pretty good with 1900 vertical, 9 lifts, and 1680 acres, but it skis much smaller than that. The problem is that we have never been there when the lower part of the mountain below 7,500 feet was open. This is quite common since the elevation is fairly low, topping out at less than 8,500′. That means that the effective vertical drop is commonly only 950 ft. The resort has only 100 acres of snowmaking and mostly old lifts and lodges. It would be a fine family area, but when we were there many of the lifts were center-bar doubles, which we found to be very difficult to load kids on safely. Since then, the resort has installed 2 new high speed lifts on the 2 major ski pods so this problem has been fixed and it should be a much better situation for families now. Uncrowded and less expensive, the resort is a good choice for central-sierra skiers looking to get away from the bustle and expense of Tahoe. They do a good job with grooming and it’s a friendly atmosphere. There are lots of shorter black runs available all over the mountain. They run a good race program for kids, and that seems to be one of the major activities going on at the resort these days. The “Polar Express” lift on the West Side area has some decent intermediate groomers. The main frontside ski pod now has a high-speed 6-pack “Mokelumne Express” which will be the main lift at the resort now and will be easy for families to load. The low elevation means the bottom of the resort does not get or hold snow very long. The terrain is “upside-down”, with the most difficult terrain on the Kodiak and Grizzly chairs at the bottom. Obviously steep terrain at a low elevation is not a good combination. Lack of capital investment has made it uncompetitive. Although it does have a high-speed quad on the West Side and a 6-pack on the front, these serve less than 1,000 feet of vertical, so it’s a quick ride up and run down. This is one of the closest areas to our house in Fremont, but we haven’t been back in 16-years. In 2014, the area was looking for an investor to implement the master plan they have approval to start, which will link the village with the resort for the first time, but that still hasn’t happened as of 2018. Still, it’s an interesting place and we need to go back there to get some pictures and check out the 2 new lifts. I used to think Bear Valley wasn’t too great like you until I experienced the lower mountain. The best part about bear valley is the lower mountain. It has a nice feeling of being “untouched” because there are no cut out trails or groomers. The terrain varies a lot, and is quite long. 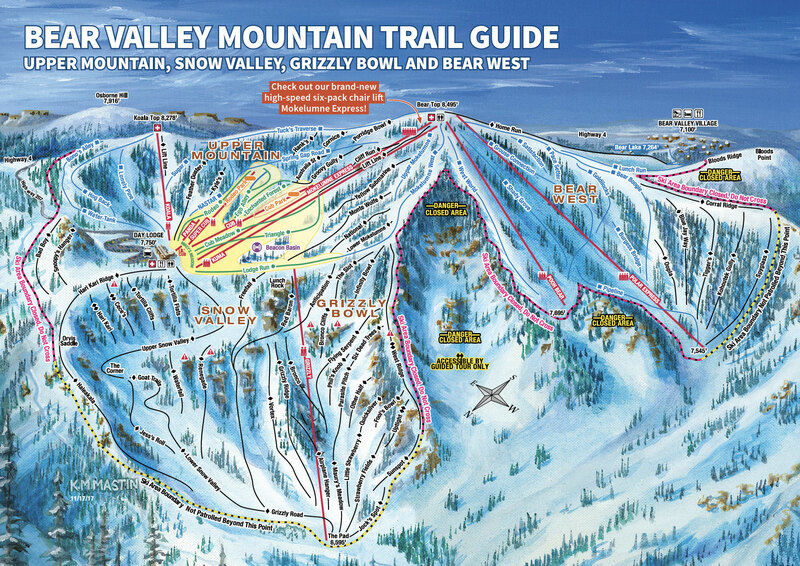 The main route down the lift line of the Grizzly chair is a leg burner, and Snow Valley is lots of not-too-steep fun. For steeps, go on West Ridge to Uptight, which is seriously steep. There is also a nice cliff band in the Grizzly Bowl called the “Bronco Cliffs” that are easy to avoid, but are fun for more daring skiers/boarders. The Grizz is massive with hundreds of possible lines, but is closed a lot like you mentioned. This season (2015-16) is especially nice because the Grizz is open most of the time thanks to El Nino. Hopefully if you ever return you get to experience the mighty Grizzly! Thanks for the comments. I know Bear deserves another ski some day. Like you said, we really should experience the lower mountain to give it a fair review. However, we have come to realize that this is a very ambitious project, so experiencing every resort on a perfect day is just not possible given how many we still need to ski. Hopefully we will get back there when there is a lot of snow.